An English faux-painted waterfall bookcase from the mid-19th century, with gilded accents and tapered legs. Born in England during the 1850s, this waterfall bookcase features four open shelves of increasing size presenting a faux finish. The entire structure is highlighted with a gilded trim while the upper shelf is adorned with a thin cartouche outline. The piece is raised on four tapered legs, accented with petite scrolls pierced with quatrefoil motifs in their center. 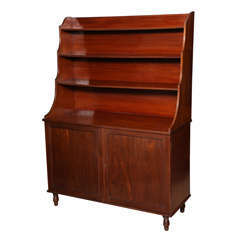 With its convenient proportions and lovely faux-painted finish, this English waterfall bookcase circa 1850 will be a wonderful accent piece in any home. Age appropriate wear. Please look at the various photos available. Italy Mid-19th century elegant Louis Philippe armoire or bookcase cabinet, in blond walnut and veneered walnut , restored and finished to wax Measures cm: H 190, W 125, D 54.